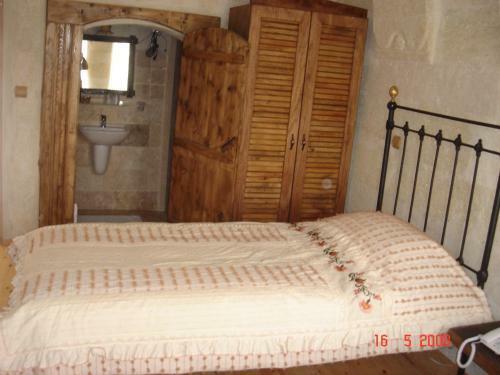 ﻿ Aydinli Cave Hotel Goreme. JIMAT di Agoda.com! Terletak di tepi kawasan bukit, hotel gua tradisional ini menawarkan pemandangan yang menakjubkan merentasi Göreme dari teres atas bumbungnya yang indah dan menawarkan bilik-bilik gua yang unik dengan WiFi percuma serta perkhidmatan peribadi. 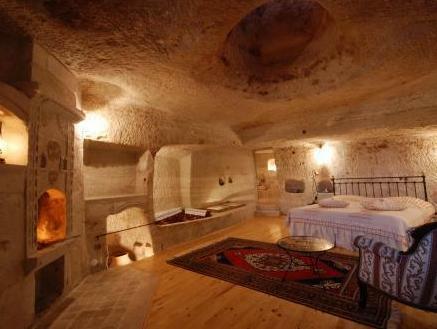 Aydinli Cave Hotel merupakan hotel kecil yang diuruskan oleh keluarga yang terletak di pusat old town Göreme. Bilik-bilik gua yang indah ini dihias secara ringkas untuk menyerlahkan ciri-ciri semula jadinya. Bilik-bilik ini menawarkan ruang tempat duduk dengan ruang unggun api yang selesa. Selepas seharian menjalankan aktiviti kembara jalan kaki atau bersiar-siar, para tetamu boleh berendam di dalam tab mandi di bilik mandi modennya yang luas. Dengan pemandangan indah Göreme, teres atas bumbung yang indah menawarkan ruang yang ideal untuk menikmati sarapan. Nikmati hidangan sarapan Turki tradisional sebelum teroka sekitar Cappadocia. Pemilik Aydinli Cave Hotel boleh dihubungi pada bila-bila masa untuk berkongsi pengetahuan mereka tentang kawasan tempatan. Mereka juga sentiasa bersedia untuk mengaturkan lawatan persiaran dan lawatan sehari sepanjang penginapan anda. I had a great stay at Aydinli Cave Hotel. Staff is very welcoming and friendly. Due to one room cancellation, they have upgraded me to a family suite which was very nice and spacious. It’s cool to stay in a cave room :) Breakfast is also really good with fresh fruits, fresh eggs of your choice etc. Overall, I really enjoyed my stay and would definitely recommend staying here if you consider visiting Cappadocia. Our stay at this hotel quite simply was perfect. The room was beautiful, clean, and stocked up with everything you could need. Great breakfast buffet. Even more amazing than the hotel itself was the service. They really go out of their way to make sure you have the best experience. All our activities were coordinated through the reception flawlessly. The staff are LEGENDS. Thank you so much!! 10000% recommended. We had a great time here. The staff were friendly and the interior was very good. Good location at Goreme, front desk staff was so nice to contact us once booking confirmed to arrange pick up service, local tour etc. His recommendations of the local tour and restaurant were excellent, staffs were so helpful that drive us to bus station. Excellent view to enjoy breakfast! Can not complain! The hotel runned by family certainly gives a warm touch during our stay. They make sure we are always okay, help us organize our plan. Kind people. The breakfast is superb. Killer view. My boys love the idea of sleeping in a cave and we had a fantastic stay. Our cave hotel was beautiful, large and clean! We were blown away the moment we unlocked the door, it is unlike any other hotel! It was very well-maintained and neat. It’s almost like fairy-tale like, just like one of those cosy little cottages you see in books and cartoons. The toilet is really clean and huge, with a nice bathtub and shower! Breakfast is at the top of the cave and offers a gorgeous view of Goreme. The breakfast is one of the best we’ve had in Turkey, home-made and delicious! The only minus points are that the TV is in the living area corner and not in the bedroom and has zero English channels which is a real bummer when there’s nothing much to do. Staff are friendly and quite accommodating, they book tours for you and give you a small gift of Turkish Delights when you check out which is a nice touch! 100% would come back! Good Service, manage to talk to the owner Mustafa such a nice man, we had a great conversation. the service given was tip top. and the Breakfast view, overlooking Goreme was amazing! good spread of food too. All the staffs was so helpful and friendly. They don’t treat you as a guest, treat you as a FAMILY! Great staffs(Erdi and the cousin)I would say all of them are excellent,helpful,kind,really serve you from the bottom of their heart and make sure you are well look after.Forget about all the tour agency and hassle about booking your tour out there,they’ll give you the best recommendation and do all the arrangement. I was sick for the whole trip and they brought me to the pharmacy,get me herbal tea at the breakfast everyday. Breakfast was great,remember to ask for the Turkish pancake if you like,must try! 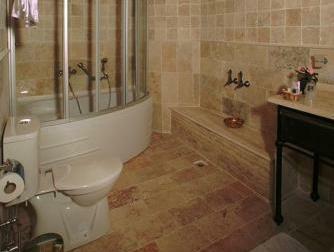 They offer Turkish bath&massage as well,highly recommended after a long day tour, you’ll definitely enjoy. Last but not least, thanks for the lovely gift (Turkish delights/handcrafted souvenirs)during checkout. It was a memorable stay with you guys! very cozy and comfortable hotel !! All steps are very friendly and kind. The location is also good. It's easy to gettothe bus terminal and the center of Gereme. The best part of staying at this hotel is the temperature of the room!! Always warm not too hot. Now, it's too cold outside. I was super happy when I came to my room. Excellent service provided by the hotel staff. They were helpful and informative with the transport and tour arrangements, especially with our early check-out time. Breakfast were sumptuous and even provided special dishes for us. They even have farewell gift for us! No wonder it's rated #1 in Goreme. The breakfast was amazing. View of the hot air balloons flying up above, while you savour the delicious home made cuisine. Staff was very friendly and helpful. Can't describe enough in words. Do go and experience it for yourself. They proactively offered us help and suggestions, they gave us free rides to see the sunset and visit open air museum. They were passionate to make their place a comfortable and pleasant accommodation to visitors, which was somehow more genuine than the other hostels we had ever stayed in Turkey. Really appreciated. And great breakfast as well, particularly love their Turkish pancakes. Awesome and very friendly staff. The locations seems perfect. The staff is very helpful. well cleaned room. would love to go there again. We stayed at another popular hotel for one night and then moved over to Aydinli Cave hotel for 2 nights. Totally didn’t regret our decision. Aydinli Cave hotel was so much better ! The staff were super friendly and helpful, and genuine compared to the other hotel. Rooms were great and comfortable! “Eddy” was really pleasant and sincere in sharing with us where to go and eat, and also offering us drinks while we waited for our night bus. The owner was also super nice and allowed us to stay in their lounge area for 6 hours! We highly recommend this hotel and also the Turkish bath which is in house too. Not like those commercial ones outside and also private usage. Lovely breakfast on the terrace too, with offerings of their own homemade dishes. Perfect stay and genuine people! Me (Wills) and my wife (Matilda) stayed at Aydinli Cave Hotel from 02 to 04 April 2018. Extremely hospitable is the owner of this beautiful place, Mr Mustafa. He personally took time to tell us about the must see places in Goreme. Ms Ozlem who is working for Mr Mustafa helped us book the hot air balloon ride with Butterfly Balloon which both of us thoroughly enjoyed. She also booked us the Red tour and Green tour. 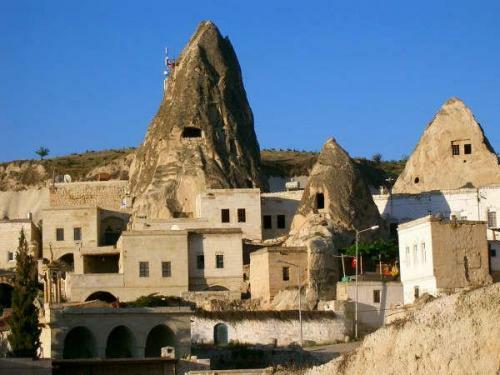 The underground city and Goreme open air museums were the highlight of the tours. Ms Ozlem went out of her way to assist us for everything that we wanted and needed. She also booked us the ATV rides and Hamam in the hotel’s premises. The view from the breakfast area was simply beautiful not forgetting the good spread of breakfast that was offered every morning. The breakfast staff were also very hospitable and friendly. Everyone made us feel like it was our home. Very highly recommended place to stay in Cappadocia. Do not think twice about booking this hotel, just do it with no regrets at all. Should we return back, we will stay here for sure 👍😃🙏🇹🇷. Thank you Aydinli Cave Hotel and everyone who served us very well indeed. Till next time my friends, God bless All. I arrived at Goreme in the morning and the hotel manage picked us up at the busstation. Even it was quite early to check-in, my room was ready and the hotel owner offered me a free breakfast. During my stay, all of the hotel staffs were very freindly and helpful, they drove me to Goreme open air museum and schedualed the bus for sending me to the airport. The roo, also clean and well decorated. Highly recommended ! !